Masoud started Aikido in 1990 at the JCCC Aikikai with Obata Shihan. At the same time, he was practicing Judo. 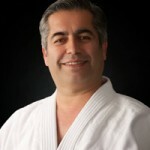 Masoud started Judo in 1983 until he decided to focus on Aikido and stopped practicing Judo in 1992. He believes Aikido can change one’s life by developing a healthy body and showing a positive approach to life. As O’Sensei said, Aiki is not a technique to fight with or to defeat the enemy. It is a way to reconcile the world and make human beings one family.